The annual Indiana Pacers FanJam presented by CNO Financial Group will be held Sunday, Oct. 5 in Bankers Life Fieldhouse from 4:00-7:00 p.m. Parking is free in the Virginia Avenue Garage located off of Delaware Street. The first 4,000 fans receive a free Pacers mini basketball as well as a voucher for a hot dog, bag of chips and a Pepsi product courtesy of CNO Financial Group. 4:00 PM | Doors open! Enjoy games, activities and giveaways on the concourses, plus an autograph session with the Pacemates, Boomer, Freddy Fever, Pacers Alumni players and the Pacers radio/TV announcers. 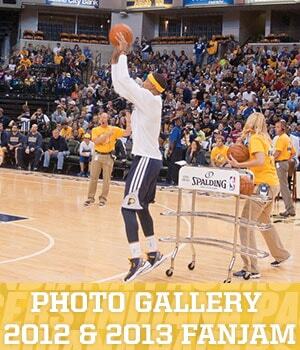 5:00 PM - 6:00 PM | Pacers take the court for a scrimmage and special, fun games and activities. Following the on-court activities, all players will be available throughout the building for an hour-long autograph session. Want to Secure Seats for the 2014-15 Pacers Season? For Pacers Single Game tickets presale registration, please complete this online form. By purchasing a 2014-15 Full, Half or Mini Season Ticket Plan, you will receive the best single-game prices for next year and playoff ticket benefits. If you'd like to learn more, please call us at (317) 917-2827, fill out this form, or chat online with a ticket representative.